What do "snapshots" have to do with anything*? It is all about perspective and perspective is driven by the position of the lens relative to the subject. The wider FOV of the 35mm allows you to frame a larger subject for a given shooting distance (i.e. perspective). If you want to flatten the perspective, increase the working distance and crop. In addition, optical design (with the possible exception of "soft" spec'ed lenses) has nothing to do with suitability for portrature. I own a couple of classic portrait lenses, but have found that a traditional fast 50 on APS-C works well. By snapshots i m ean work's for the internet, works for showing online, not large prints. the focus ring on a 35 vs a 50 mil is totaly diferent, on the 50 i can focus @ 10meters, on the 35mm for instance after 4.5 meters it's the infinite mark, and like someone said, if you step back you get thinner DOF. and i've been shootign in fullframe pentax again, for the last couple of months and wheni pick up my k20d the crop makes it feel like a child's toy, not trying to understimate my best friend (k20d) but it sure feels like that..
Just to get this straight.... A 35 on 1.5x crop is equivalent to a 50 (or more precisely 52.5) on FF, at least as far as perspective goes. The resulting viewing angle (and only viewing angle) is what determines required distance and hence perspective distortion. You can get the same viewing angle with a large sensor and long focal length or with a tiny sensor and short focal length. For a classic 1/1.8" sensor (8.98 mm diagonal), the equivalent of 50mm on FF would be about 10.4 mm. DOF is a different story, but even then the difference between APS-C and FF would be minor, and easily dominated by a change in distance. And of course the focusing ring marks on a 35 and 50 will be different if both of them were built for the same sensor/film format. After all, the 35 would have had larger DOF due to not only being shorter but also having a significantly smaller maximum aperture, and hence required less accurate focusing / a shorter focus throw. That's why my M 28mm 3.5 gets by with a measly 90° turn for 0.3m to infinity while its 50mm 1.7 counterpart covers 0.45m to infinity in about 210° (which takes up maybe 60-70° on the 28/3.5 - seems about right for a factor of 2 in max aperture and 1.8 in focal length, or about 3.5 in total). Unfortunately, there is one little problem in crop DSLRs: There is no 35 with truly equivalent performance to a 50 on FF. This is because they have inherited registration distance (or flange distance, or whatever you want to call it) from their FF ancestors along with the mounts, and hence the required backfocus distance for lenses. A lens can only stick so far into a SLR camera without getting into trouble with mirror clearance, and once the distance from the final element to the sensor (i.e. backfocus) exceeds desired focal length, you've got a problem. For M42 or PK, the limit is somewhere between 40mm and 35mm. At this point, you have to resort to resort to retrofocus a.k.a inverted telephoto designs, which place at least one negative meniscus element in front of a "conventional" lens to achieve a lens that is physically longer than its focal length, including the desired increased backfocus distance (while regular telephoto lenses do the exact opposite). These meniscus elements can get pretty big, depending on how short and how fast you want to go. This is why a 40mm 2.8 is a tiny pancake lens and a 35mm 2.8 is almost as long as a 50mm 1.7, and they get bigger and bigger as focal length is reduced further (hence why you're looking at ultra wide angle lenses with f/4 or so to keep size halfway reasonable). Retrofocus lenses generally also are not as sharp / need more stopping down. 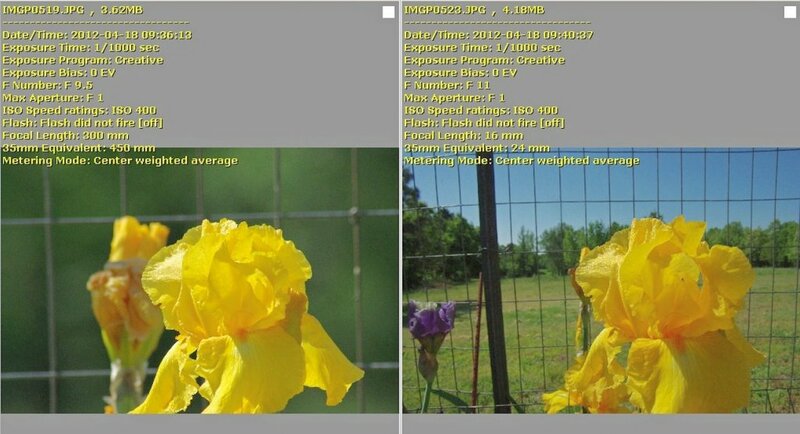 Focal length tells its own story about the image irrespective of so called "comparability" between FF and APS-C.
or cropping of the original image. Here's a rather extreme illustration to make the point - 16mm vs. 300mm is used here. if in a portrait - as was illustrated above. 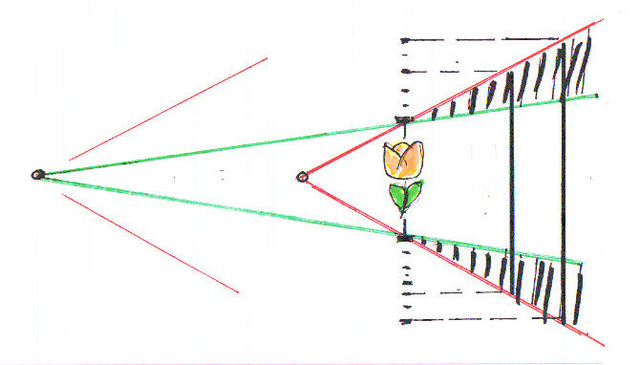 DoF could theoretically be equalized by choice of aperture but not the perspective and 'vanishing points'. 'Perspective compression' is only a function of the distance to the subject, so it does not make sense to claim that a particular focal length is more suitable than another regardless of sensor size. The fact is that a 35mm f/2.4 on APS-C is equivalent to 52mm f/3.6 on full-frame in terms of both perspective compression and DOF, when taking the shot from the same spot. To the OP - the two lenses are different enough to have them both. I'd get the 35 (I have it) and keep the 50 (I have a few, but not the M 1.7). If your camera allows, you need to change the screen, I recommend the Katzeye range, pricey but good, never looked back when I got mine, now in all my bodies. Some real food for thought here - thanks everyone. I hadn't considered the 40 XS before - that could be a good compromise, especially as I take my camera pretty much everywhere with me. The angle of view/perspective thing is very interesting - I need to read up more! Dang! Thanks for this post. All of these things regarding focal length were discussed in incredible depth on this forum about 5 years ago with many, many example photographs. I wish I had kept the links to the threads. Tim, i'm not sure if you notice, but if you look at his post #4 where he compares 2 pictures of a model(subject) between 24mm and 160mm. Observe the background in relation to the subject; look at them fences. Don't using a longer focal length "stretch"/iincrease the background size in comparison to the subject? Perhaps this is what he is meaning to say? Edit: Ok, looking at the composition, it seems changed.. But i think you get what i mean anyway.. LoL! No, SyncGuy. Take the later post with the flower and the netting. It's the change in the physical location of the photographer that increases the size of the netting etc. by comparison with the flower (or, if you prefer, reduces the size of the flower relative to the netting). If you stood in the same position that the photographer adopted for the longer lens, and used a shorter lens instead, the relative sizes of the flower and the background would be same as in the longer-lens image. They would BOTH appear a lot smaller of course relative to the frame, and be surrounded by a lot more context. Wow, I've learned a lot from this thread. Thanks to those of you who contributed the photo comparisons. To the OP, I have a K55/1.8 and a DA35/2.4. I'm actually quite happy with the 35, though I would NEVER consider replacing my K lens with it. If I was forced to chose one over the other, there's no question which I would leave with. You got such a bargain on your 50, If you feel like you need AF and something wider, I'd try to add it instead. All times are GMT -7. The time now is 07:22 PM. | See also: NikonForums.com, CanonForums.com part of our network of photo forums!